10 weeks in non-op. feeling good! I see PT again this Thursday. I’ve done the stationary bike & ~10 min on the stair machine, but haven’t done any cardio machines at the gym w/o the boot yet. OK, so I guess transitioning into 2 shoes isn’t as smooth sailing as I thought it’d be. I’m still just wearing shoes in & around my home, but that can still translate into a lot of walking when tending to my 2 toddlers. Yesterday & today I’ve been feeling more of a new ache & soreness near the rupture site that got me worried. Also a bit more stiff in the a.m. I’m assuming its from using my foot more over the past week while using shoes around the home, but can’t help from feeling a little set back. SO, sporting the boot & trying to “take it easy” more the next few days . Hoping it passes soon! Put on a left shoe to my recovering foot for the 1st time in 8 weeks! (non-op). Last pm, just stood up, but didn’t have the guts to try walking. I tried walking around the home in 2 shoes - 1st with both crutches, then 1 crutch on opposite side, then no crutches after some practice. It felt SO good to be wearing a sneaker. I plan to start wearing 2 shoes a little more each day at home, but don’t plan on wearing shoes to work just yet. I’m 7 weeks post injury, non-op & started FWB around week 4. It’s been a lot easier to get around without crutches or rolling around my home in an office chair. I took all the wedges from my aircast over the past week. I do find that I get discomfort in my heel after short periods of time. I get immediate relief when I loosen or remove the boot. It doesn’t seem to lessen when I use a shoe insert with arch/ heel support. I’m hoping that it’s related to the boot & won’t be a factor when I can wear shoes, but we shall see! Planning on hitting the stationary bike at the gym today & I’m SO looking forward to it. Have a great weekend everyone! I’m ~4 wks out from injury, non-op, & saw PT yesterday. It felt good to be able to start engaging my bad foot (left) back into my life. I can stand on my one booted leg while holding onto a counter for balance, & I am putting more wt on it while walking very slowly around the home. I am using 1 or 2 crutches most of the time, but have meandered around the kitchen without any crutches on occasion. The heel is where it starts to feel funny when I’m using it more, but there’s immediate relief once I rest or take the boot off for a moment. It feels so much more hopeful at this point! Even having one hand free while holding one crutch on my good side is liberating:) At one point, I thought I could return to work this week, but I already decided to take more time off to allow more time to recover without pushing it. Being up on my feet more at work than what’s necessary for recovery doesn’t seem the smartest thing to do right now. I’ve also noticed that being on the ankle scooter was positioning my boot to add some bothersome pressure on my achilles. Anyway, I’m just having to remind myself not to do too much too soon, as others on this blog have alluded. Take care everyone! I’m starting to get rub burn from crawling around the carpeted floors tending to or playing with my kids, or crawling up & down the downstairs for stuff. I’m looking forward to graduating from crutches! That being said, while I am on crutches & moving towards full WB during weeks 4-6, did anyone have problems with leg-length discrepancy, DESPITE using a balancing product such as “evenup” (see below) on the good foot? I purchased this from Amazon per advice from PT, & I am using it with a running shoe, However, my affected leg is still longer. I’m hoping that things will even up when the heel lifts are out (1cm x3), to prevent new ailments such as back or hip pains. I guess having my leg exposed was over-rated. I was pretty nervous & paranoid when I’d take off the boot for dressing & bathing - to the point that I couldn’t wait to get the boot back on for protection (kinda like a security blanket). I’m 3 weeks post injury (non-op route), & saw PT 2/14/19. Reviewed some simple exercises in plantar flexion that I’ll do in the next few weeks. I was discouraged about the height discrepancy that the aircast/ heel lift left me with. my PT recommended the “Evenup” shoe balancer, to be worn on the unaffected foot. I was convinced that it’ll be useful so ordered it of amazon for $30. Will update on how that goes. My foot & ankle are a tad more swollen than previous with some mild bruising at the base. Had my 2 wk ortho f/u appt today. Cast came off & I guess I was building things up in my head to reunite with my left leg. I expected it to be grimy, laden in dry skin, & hairy. It was anticlimactic to see a somewhat normal looking leg. I was bummed about the calf atrophy, but that’s to be expected. There was no significant swelling or bruising. I imagine the edema may come along more as I learn to use my leg in the weeks to come. I’m looking forward to starting PT tomorrow. They didn’t have the DonJoy boots available that day, so I will obtain that tomorrow. My cast was still intact in a front & back slab, so I’m using that, wrapped in ACE wrap until I get my boot tomorrow. I’m taking the advice of a previous blogger (kiwiclaire) - IF the boot is too uncomfortable to sleep in, I specifically asked the ortho technician to let me keep the front slab so I can use it (wrapped in ACE wrap to keep foot in equinus) at night to sleep, He graciously mettled with the padding so that any sharp edges weren’t exposed. I’m ecstatic to finally wash my leg this evening. WOOO-HOOO! I NEVER thought I would be so happy to get my hands on a shower chair! After 10 days of showering on an ‘all purpose Home Depot bucket,’ I was tired of doing 1 legged squats when getting up from such a low position. The chair upgrade really helped me be more comfortable & feel safer in the shower. I’m 10 days post injury. I chose non-op for my rupture. Cast comes off in 6 days (2 wks in cast), & then the following day, booked my 1st “date” with PT on Valentine’s Day. I’m looking forward to starting rehab, albeit being a slow recovery. Yesterday I decided to inform my work that I’ll be out longer, at least 4 wks post injury. It’s so hard to predict how moving around will be once the cast is off & boot / heel lifts are in. My job involves moving around a hospital & seeing patients. Doesn’t seem safe to risk falling from a scooter or from crutches while attempting to work. I’m hoping to not use the scooter (or crutches) at all when back at work, taking into account what other bloggers have been advised by their PTs. Also, using the scooter while in a boot actually seems it would be uncomfortable. Thoughts? Judging from others’ posts it seems quite variable on when people ditch the crutches. I’d appreciate anyone’s input on your experience on when crutches weren’t needed. I have 2 toddler boys (2&4 yr old). They seem to understand that ‘mommy can’t do this or that…’. With the iwalk 2.0 prosthetic, I’ve been able to do some of my routine house chores like dishes, laundry, cooking. I’ve been able to occupy myself pretty well so far during this 2 wk NWB period. Since my right foot is good & well, I’ve been able to drive, take care of simple errands, meet friends for lunch, do some ab exercises… still getting restless at times. Sniper on the tennis court! That’s what I thought was happening when I felt & heard a sound as if someone threw a ski ball at my posterior ankle. As I turned around to find my assailant, I was on the ground since I couldn’t bear weight on my left ankle. My mixed doubles teammates assured me that no one was there & I immediately noticed that something was terribly wrong with my Achilles. I work as an Internal Medicine doc & I already assumed I at least partially tore my achilles. I wasn’t in much pain, but was immediately angry & disappointed knowing that this injury was gonna put me out from normal activities for many months. I just starting getting back into tennis Nov 2018 after 18 years hiatus from playing competitively in college. I was playing on average of once a week, in addition to occasional cardio at the gym, jogging, running the stairs & jump roping. I guess that wasn’t enough to condition my tendons for all the “pushing off” motions that day. It was my 1st league match (USTA mixed doubles) & I was having the MOST fun. we actually won decisively & the injury occurred during a “practice” mixed doubles set afterwards. Surprisingly, I wasn’t doing anything too explosive in terms of the movements, but I wonder if all the wear & tear just exceeded what my tendon can handle. Confided with a sports medicine doctor friend that evening, got hold of a camboot walking boot the next day, but then was advised by the ortho PA at my hospital I work at to get in a splint in plantar flexion & be non-wt bearing. My neighbor who works in primary care helped confirm I had a tear. The injury happened 1/26/19 & I had my ortho appt 1/29/19. Tendon rupture was confirmed clinically, & I was placed in a short leg cast (I chose black:) in mild plantar flexion. After hearing my options, I opted for non-surgical treatment. I figure that if surgery isn’t required to recover & if I can rehab just as well, I’d rather not have surgery if I don’t NEED it. I have a f/u appointment in 2 weeks. I went from the highest high to a pretty big low. A lot of other misfortunes have been happening to me in the last few months, & I certainly didn’t need this injury. It’s already challenging enough to keep up with my 2.5 & 4 yr old toddler boys when I’m healthy. I’m 39, pretty active & love to be busy & on the go. I guess this achilles rupture was the universe’s way of telling me that I need to stop, slow down, & just SIT. I’ve been able to be somewhat mobile while non wt bearing on my left foot. I can still drive. I borrowed one of those ankle scooters & this “pirate-peg-leg” orthotic see pic below) from work colleagues. They have worked WONDERS for me in terms of getting around the house & out in public. So despite having the cast for 1 wk now, I’ve been able to meet up with friends for lunch, go to the grocery, even get to a hockey game for a friend’s bday! I HIGHLY recommend this iWalk orthotic. totally a game changer. I still have to use the crutches with toileting & after showering, but the peg leg is definitely preferred over the crutches. I tell my kids that I’m a peg-leg-pirate. I was more excited about it since the novelty wore off for them pretty fast. I know you all know this already, but it is SO tough to be non-wt bearing & to have this injury. I hate how I have to plan do the most menial, mindless tasks that we take for granted normally. I’m disappointed that I won’t be back on the tennis court for months & that I can’t take my kids on the normal outings nor run around with them. However, I know I’ll get through this. I’m fortunate to have a wonderful husband, healthy kids, a much needed nanny, supportive friends, & an accommodating job. Even my dog seems to be stepping up & giving me more affection. I’ve already gotten a lot out of reading the posts on this blog. I am empowered & encouraged. I’m looking forward to rehab & literally getting back on my feet! Congratulations! i am really happy that you’re progressing! When I no longer notice my foot I know I’m close to full recovery. Glad you’re progressing! Yes do be careful! And take smaller steps so you can walk without a limp. Until you get the strength and flexibility back you can’t walk a full stride without limping and those 2 things just take time. I’m at 33+ weeks and still have to think about my foot as I go downstairs. When I no longer notice my foot I know I’m close to full recovery. And I’m still icing as well. As my doctor reminds me on every visit. It’s 1 year for full recovery …. A provocative thought about the surgical versus nonoperative approaches, if I may. I suspect there is no difference in the outcomes of those two approaches because people who have surgery usually go through a rehab that assumes the surgically repaired tendon is just as weak as a nonop tendon. I had surgery, started very lightweight calf strength work less than 48 hours after surgery, and gradually increased the resistance from there. I was putting the limited, but not zero, strength of the surgical repair to work, starting soon after the postop pain had subsided. Because of this early strength work, and perhaps because of using a vibrating massager, my calf atrophy was not that bad. I was able to do a minimal single leg calf raise nine weeks postop. By three months postop, I was doing multiple sets of 30 single leg calf raises every other day. This is just one person’s experience, and maybe I was lucky to get away with this accelerated rehab, but I do wonder if this approach could work for others who take the surgical path. dan914 - thanks for dropping a line & letting me know how far you’ve come. I MAY play tennis again in 9-12 months from injury. We’ll see. I agree about the variability about when ppl choose non-op vs op. No right answer I guess. others are surprised to hear that I didn’t choose the procedure, nor didn’t need surgery to heal. I work in the medical field so may be a little biased in weighing in the benefits, risks, & alternatives to either route. Hey Jobie, I was just checking in on the site, when I came across your blog. Like you I went non-op. Frankly, I am surprised more folks still seem to opt for the operation, despite the outcomes being essentially identical if you go early weight bearing. My surgeon definitely encouraged me to let him cut, but after 3 1/2 months post-injury he seemed to agree that I’d made the right choice. It’s an emotionally devastating injury when faced with the long road to recovery, and disruption to lifestyle, especially for active athletic people (who are the most likely to suffer it). I’m 7 months out, and am still not completely “over” it, but I can walk, play golf, and generally have my life back. I did mine playing pickleball (for the first time) and have chosen to give up racket sports. I’m 65 years old, and I just don’t trust myself. Good luck, and this too shall pass. I am also a “non-op”. I’m 7 months out. 9 weeks was just about exactly when I went to two shoes, and also when I started formal PT. Ice is your friend. I was very weak when I started in 2 shoes, but you’ll progress. You’re still early in the healing process so icing and elevating are still a good idea when you’re feeling aches/pains. I’m 33 weeks out and I’m still icing. And, yes, you’ll have ups/downs in the healing process. Generally the downs come when you overdue it - LOL! What boot are you using? I get discomfort with my boot, around the top side of my ankle, never the surgical site. Im thinking of getting the Vacoped advertized here. Thanks everyone! I ordered an evenup on Amazon and am waiting for it to arrive. I went into a shoe store today and they gave me a handful of shoe inserts to put under the actual insert for a pair of Sorel boots I have. She said they could go in any shoe that has a removable insert. I’m hoping that with the inserts and the evenup I can get close to the same length as the side with the boot. I ordered 1 evenup and was sent 2. For my first foot using all the padding for the even up was sufficient. For my 2nd foot they changed the boot and this one had a thicker sole compared to the first so I had to use all use one of the even up layers from the 2nd one to get the even up high enough. I have some clogs that have a pretty thick sole and those got me just about even as well if I felt like clogs instead of shoes. I’m still trying to figure out the PWB -> progress to FWB as tolerated. I’m 4 wks out from injury, non-op. When I use the “Evenup” on the good side, there is still a slight height discrepancy, but I’m hoping it’ll be trivial in the scheme of things. I’m putting some (but not full) wt on the affected side while crutching, since it’s not super comfortable to put more wt than I can tolerate. 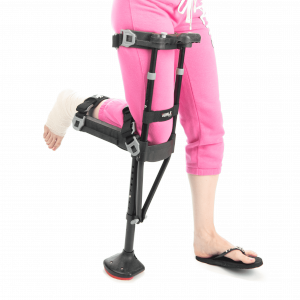 Today, I crutched along on a sidewalk on the way to lunch & I was getting some discomfort in my hip from holding the bad leg above the ground so much to avoid FWB (i.e. flexing my hip front-wards to help to “walk” while PWB). Putting the “Evenup” helped offset this somewhat, despite my legs NOT being an exact equal height. It may not be crucial to have something like the Evenup for moving small distances. I haven’t been using it around the house as much. Sorry about the sleeping woes. Seems like everyone is having that issue while in the boot. I did have the orthopedics technician save the front slab of my cast for me, so I can sleep in it, rather than the boot. I wrap the cast & leg in ACE wrap for sleep. Thanks for this post! I had surgery 10 days ago and had my cast/splint removed today. This was supposed to happen at the 2 week mark but there was something poking me in my cast so I went in today. I’m in an air boot for 2 months. I was just wondering how to put weight on the injured side when the boot adds so much length. Right now I have 3 heel lifts. I don’t start PT for another week or so and appreciate the evenup attachment suggestion. I’ve been having back/hip pain from sleeping in weird positions but am going to start doing more stretching to see if that helps. prior to my surgery, to deal with the leg length difference, I wore a hiking boot on the good leg with the boot on the injured leg. It was less than 2 weeks, hence I only felt a slight strain but not back/hip pain. Another friend of mine ( who had surgery to remove a bone spur at the heel) wore a steel toe shoe, to match the leg length with the boot. I never had terrible back or hip pain due to the leg length descrepency, but I definitely noticed it effected when I transitioned to shoes. I caught myself hiking my hip and being very stiff overall in my surgical leg. I never ended up buying the even up shoe, but I regretted I never got one in the beginning. I think it would have made things a lot easier and more comfortable. Yes, east coast. 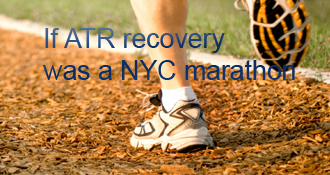 We are not in a race for recovery with each other! I tell myself that because I’m pretty competitive, which is why I got the ATR in the first place. oakmanii - I guess there was something in the air that day! bad luck for us both. I’m in southern california. orthopedics tells me that recovery (surgery vs non) would have a similar timeline, but I wonder if you’ll recover faster than non-op. everyone’s rehab course is different no matter what I imagine. are you in the US as well? Wow, I was injured the same day, but I went with the operation, I will be following your progress, Are you in the US? You definitely need an even up when you’re walking in the boot unless you have a pair of shoes that have the same amount of elevation. Without the even up you’ll end up with an unhappy hip on the good side. I went back to teaching a week after surgery. I was in a splint for three days, then he put me in the boot, NWB. I did tear my Achilles at work, so it’s a Work Comp case and my surgeon’s goal was to get me back quickly. Also, the work comp pay was less than my salary, so I wanted to get back to work as well without using a lot of my sick days. I was on restricted duty–only standing for 15 minutes at a time– and I had a scooter to get around. A colleague who lives nearby drove me to school, lugging the scooter into her trunk every day. I teach high school, so it was easier to just sit at my desk with my foot propped up on it for several weeks. If I taught elementary, I probably would have taken more sick leave and waited until I was more mobile. The teenagers were fine with me sitting all the time. Little kids are a whole different ballgame! Hey! I’m 3 weeks post-op, so a little bit different. I’m 39 also! I’m 4 weeks NWB, casted right now. I think the decision to take off work is a very hard one. I teach, and have massive teacher guilt for being gone so long. Although I have moments in my work day where I can sit, I have A LOT of movement during the day, which ultimately led to to decide to take off for the NWB stage and then get used to walking the boot and a little PT under my belt before I go back. I know that I have made the best decision for the healing in the long run. I use the scooter just around home, navigating the kitchen. The length of the cast does cut into my leg when I rest on the knee portion but getting around the kitchen it’s fine. I don’t think I could do it at work but have known others who have no problem. I don’t recall exactly who but one guy who tried using crutches at work finally switched to the scooter since it was so much easier. Good luck on this long journey! Good luck with the recovery! As you know - you have a long road to full recovery. And don’t expect that you’ll recover the same way as someone else. My own 2 feet didn’t recover the same - LOL! jobie3997’s AchillesBlog is proudly powered by WordPress and WPDesigner..